On our very last day in NYC, Adrian Murcia of Blame it on Rioja was thoughtful enough to suggest a quick visit to an exclusive Spanish wine shop called, Tinto Fino, where we met with his friend and co-owner, Kerin Auth. Located in the East Village, Tinto Fino manages to pull off a modern, yet cozy, design featuring approximately 250 Spanish wines divided by region, and priced affordably. For two Iberian wine lovers who were already smitten with our whopping 24 hours in NYC, Tinto Fino was the perfect icing on the cake. Unfortunately, time was limited, as we had a previous engagement forcing us to leave Tinto Fino well before I had fielded all my questions from Kerin. However, upon returning from a relaxing camping trip in Maine, Kerin has generously provided us with more information on both Tinto Fino and the Spanish wine scene as a whole, as she sees it from the Big Apple. 1. Tell me a bit about how you got involved with Tinto Fino? I personally began my journey with Tinto Fino in January 2009, although the shop was founded and created by my socia, Mani Dawes, back in October 2006. I met Mani in 2004 when she opened TIA POL, her amazing tapas bar over in Chelsea, where she was my client. Before Tinto Fino, I worked 7 years representing the enormous Spanish wine portfolio of Jorge Ordoñez here in Manhattan as a portfolio manager and on premise specialist. We immediately had a mutual respect for each other and moreover, formed a deep friendship guided by our overwhelming connection and passion for todo Español. The rest is history, we became partners in January and have great plans and high ambitions for our brand Tinto Fino. 2. For the layperson, what makes Tinto Fino different from other Spanish wine shops? Well first off, I don’t believe there to be any other exclusive Spanish wine shops in the rest of NY, and I donÂ´t know of many others in the US. Forgetting that, Tinto Fino is run and operated by very knowledgeable, service orientated, very passionate and fluent in Spanish, women. We have many years combined of living in, working for, and learning about all of what Spain has to offer. We’ve been to most of the regions, more than once, we know the vitners personally, we’ve seen the vines and the bodegas, and heard stories from the families and personas who represent these properties. We offer a wide range of styles, regions, philosophies, and tastes, and we can personally assist EVERY person that walks through the door, calls us or contacts on line. I think overall we provide a very Spanish experience. We like to call it a little more olé than the rest. 3. Do you actively pick out your wines based on a particular criteria such as a style, region, brand or grape? I like to choose the wines that are the best representations of the regions soil, climate and grape varietal. I think that can even range in style within each region, but the goal of the store is to have the best value, the most variety, and the tastiest wine within each region. I also believe in tradition and innovation so we try and represent the old and the new to our guests. A selection of both past, present and future of Spanish winemaking. 4. You mentioned that sherry has become a hot item in your store. Does this include both dry and sweet sherries? And what do you chalk its success up to? I think that here in NYC we have an advantage of having access to a lot of great knowledge, product and exposure when it comes to Sherry. It has ABSOLUTELY become more popular, especially here in the shop…bot dry and sweet and everything in between.One of the largest reasons I think is the increasing popularity amongst sommeliers and chefs to incorporate sherry into their lists, menus and food pairings. As you and know the marriage of food and sherry is heavenly, so as the overall diner in NYC is perhaps a bit more adventurous or say, exposed to so many more esoteric and exotic menus and ingredients, the overall opportunity to make a brilliant pairing is widespread. We have many customers who are shopping through our 35 various selections…we love it. 5. You also mentioned that wines from Levante were garnering a considerable amount of attention. Any thoughts as to why? I think the reason for the increase in the sales of the wines relatively newcomers of Levant is pure taste-value ratio and the fact that every day there are more producers offering wine from Jumilla, Bullas, Utiel Requeña. For us here in the States too, I think that Monastrell and the hotter climate of the Levant reminds people of California in some ways so they are able to make the transition to buy Spanish wines through their experience with those areas. I find that most of my best value wines are from the Levant. We SHIP. Anywhere the state allows us to. You can purchase directly from our website, and one of our three employees, including me, will process the order and have it shipped via UPS pending your delivery options. 8. 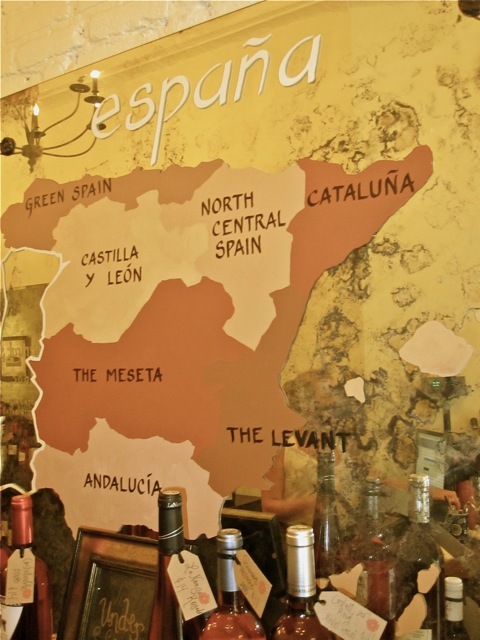 For beginners to Spanish wine, is there a style, region or grape that you would suggest they start with? Well, great question…I guess it depends on what NON-Spanish wine they usually drink. I think that Tempranillo is always a great way to introduce OLD world drinkers to Spanish wine. There is nothing like a classic Rioja to tempt a lover of Burgundian wines…and with some of the more modern technique from the Alavesa, there are some Bordeaux drinkers that would be happy to find something well made and affordable for more frequent consumption. If someone normally drinks California wine or something a bit more modern in style, I think the Levant or Priorato is a great way to go…The juiciness of the Jumilla region is a great way to woo Zinfandel and California Cabernet drinkers. The Verdejo grape is most easily introduced to Sauvignon Blanc drinkers and definitely one of our best selling regions in general. 9. We talked a bit about the Tetrapak rosado you’re offering. Can you fill us in on the story behind it? The YELLOW AND BLUE tetrapack is a “green” project founded by: YB Wines and made from all organically farmed fruit. In addition, they are in liter square packs, offering you more wine for the price. In doing so, they are able to ship more wine in bulk using less energy. The cost and energy behind shipping one container of 12 bottles cases is the same as one container of tetrapacks for the same ml. quantity. 10. You’ve had a considerable amount of experience with Spanish wine over the years. In your mind, what are some of the misconceptions people have about these wines? I think that everyone who has said: “I don’t really like Spanish wine” needs to taste a few more these days. Spain is such a diverse country with so many different styles of wine-so many climatic variables, varietals…there really is something for everyone…you just need to tell the story of your palate to the right person in guiding you to the wines that may suit your taste most appropriately..I am proud to say that here at Tinto Fino, we have done just that…winning over and converting many people to the delicious wonders of Spanish wine. Thank you Kerin for your time! And if any of you have questions for Kerin, please don’t hesitate to list them in the comments below. I trust she’d be more than happy to field them for you. Tue-Saturday:	12:00 p.m. – 10:00 p.m.
Sunday:	1:00 p.m. – 9:00 p.m.